This last Sunday I had some side work that paid out pretty well, so today I brought in a veritable cornucopia of cheese. Starting at 12 o’clock and working clockwise, there is a black pepper affiné, gorgonzola, extra aged asiago, and Grand Cru. The Wyngaard Black Pepper Affiné is a gouda with a cracked peppercorn crust. The cheese itself, without the crust, just has a hint of pepper flavor to it but that crust is just amazing. If you have any problems with spicy foods or just don’t like pepper then this is one to avoid. Otherwise, it is a favorite here in the IT department. Roth’s Grand Cru is an excellent hard cheese with a nutty flavor like a mild gruyere. This one got a lot of compliments today as well. The Extra-Aged Asiago from Sartori is quite simply, amazing. If you’ve not tried any of Sartori’s offerings then I would highly recommend giving them a shot. 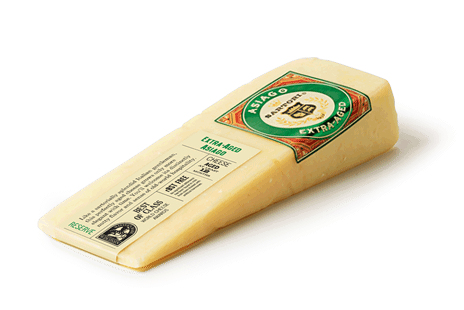 Their BellaVitano cheeses are all splendid, as are their more traditional hard cheeses. How can you go wrong with an asiago on steroids? Lastly, the Amablu Gorgonzola is without a doubt, the finest gorgonzola that I’ve ever had. Strong, pungent, very blue but with a soft, butter creaminess to it that just makes it melt in your mouth. Outstanding flavor, texture and aroma.